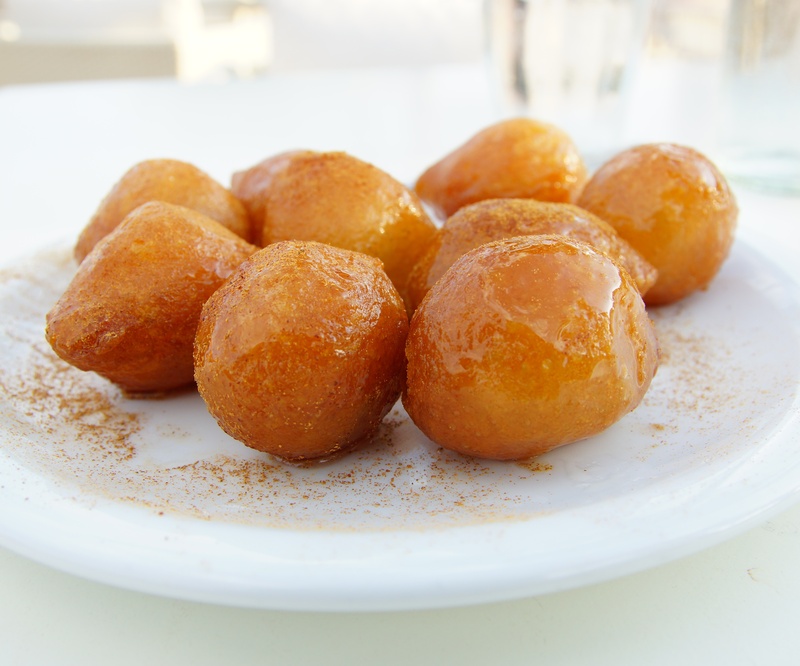 Loukoumades, one of my favourite Greek pastries, are sweet fritters (similar to doughnuts) that are deep fried till golden brown and served warm with a honey syrup, sprinkled with cinnamon and nuts. These light airy, crispy pastries are the perfect dessert for a celebratory meal. Just be prepared to get deliciously messy when eating these purely yummy puffs. In a large bowl, mix yeast and sugar into 1/2 cup of the warm water. When mixture turns foamy, about 5 minutes, stir in remaining 1-1/2 cups warm water along with the egg, flour, salt, nutmeg and vanilla. Mix until batter is thick but smooth. Cover with plastic wrap and let rise in a warm place until almost doubled in size, about 1 to 1-1/2 hours. (The dough should be very soft and bubbly.) In a deep fryer, large heavy pot or Dutch oven, heat 3- to 4-inches of oil to 375 degrees F.
Make sure there is at least 2-inches between the oil surface and the top of the pot. While oil is heating, prepare honey-lemon syrup. Add honey, sugar, and water to a small saucepan, mix to combine and bring to a boil over high heat. Reduce heat to low and simmer, stirring occasionally, until sugar is completely dissolved. Stir in lemon juice, lemon zest, and simmer until lightly thickened. Remove from heat and keep warm. Working in batches, slide dollops of the batter (about the size of a heaping tablespoonful each) into the hot oil, making sure not to crowd the pan. Dollops will puff up and float to the surface. Fry, turning occasionally, until pastry is a crisp, golden brown on all sides, about 3 to 4 minutes. Remove carefully with a slotted spoon and drain on paper towels. Repeat as many times as is needed. Place drained puffs on warm platter and keep warm. To serve, place 4 or 5 fried puffs into the warm honey-lemon syrup. Allow puffs to soak for about 10 to 15 seconds, remove to a small plate, dust generously with cinnamon, and sprinkle with walnuts, to taste. Or, (no dunk method) place 4 or 5 puffs onto a small plate, drizzle with warm honey-lemon syrup, dust generously with cinnamon, and sprinkle with walnuts, to taste. Loukoumades are best if eaten warm, the same day they are made. Makes about 36 to 40 puffs, or 8 to 10 servings..